The IFTTT is the abbreviation of “If, This, Then, That” which is an online service that has the ability to turn major web-based apps or any Wi-Fi connected device into your personal concierge. This tool is not that hard to understand but it is still new for many, because, very few people know about it. To understand, it is better to discuss it with an example: I am a social media manager, and I meet a lot of people and randomly add them into contacts on my phone. Maybe, any one of them could be my client, and he calls me from a new phone or any other I have met at a networking event. However, these numbers are not necessarily going to get added to my CRM (customer relationship management) software. What if I lost my phone or something happened to it that make me lost all of my data and contacts list? This is where the apps like IFTTT helps us, with the IFTTT, I can easily manage my contacts by storing it in the spreadsheet of Google Drive or any other cloud service which will help me in never losing the contacts again. Moreover, the IFTTT is not only helping me in keeping my contact secure, but it is also helping me a lot in my profession. Since the IFTTT is linked with almost everything which is connected to the internet that is why it is helping me a lot too in managing my social media accounts through various applets. Following are the top 10 IFTTT applets that are maximizing my social media productivity. This applet serves two purposes. One, it helps you to keep the data of all of you statuses that you have posted on your Facebook page. You can also add more columns in the sheet to maintain the analysis of each status. Second, it helps the writers a lot to go through the past statuses and to come up with something new by tweaking the last ones. Get this applet by clicking here. Just like the first one, it also work as the backup of all you tweets that you have done till date and the guarantee for the future too. The use of this applet also allows you to upload evergreen content into the Google Drive or the Dropbox. Get this applet by clicking here for Google Drive or click here for the Dropbox. It is always better to engage multiple social media platform for the marketing purposes. The more on the platform you work the better your chances are to reach maximum people. However, involving multiple platforms make hard for you to manage the content and postings. That is why I always use the applets which help me in doing cross platform postings easily. With this applet, you will be able to pin the photos that you post on your Facebook page with the same content to the Pinterest without even logging into you Pinterest account which save a lot of time. Get this applet by clicking here. Another applet for the cross platform posting. This applet is combining the two social media platforms which are entirely different from each other. The Facebook allows you to post the same content on the Instagram even boost it because they both belong to Mark Zuckerberg. However, except this applet, there is no other app or any tool which allows you post the same images of Instagram into the Tweeter. Get this applet by clicking here. Twitter is all about using the hashtags and mentions in the right manner. Hashtags are not trends. They use to build the trends. However no one knows why people use it on the Facebook because Facebook algorithm doesn’t work that way. Keeping the hashtags and mentions in monitor is important because being a marketer it helps you analyze the rate of targeting things. This applet create a spreadsheet with all the mentions and hashtags you use in your tweets. Get this applet by clicking here for mentions and click here for hashtags. This applet would not help you a lot in your social media marketing but it will surely help you in keeping the images changing. By saving the Instagram photos in your gallery, it allows you to use your internal image editing tools to edit the image and then post it on other platforms. It also help you in keeping the data of all of your Instagram posted photos. Get this applet by clicking here. Pinterest may not be a platform with the same audience like Facebook or the Twitter. However it can always go along with the WordPress. To keep your Pinterest board updated with your WordPress postings, click here to get the applet for it. Facebook has a very good system of saving all the images. However, in commercial activities there is always a chance of any cyber-attack and to save your data, this applet can help you. Click here to get the applet which will directly save all of your Facebook photos directly into Google Drive. With this applet, you will not only create a backup for Instagram photos and videos but can also use it on other platforms. Click here to secure your videos and click here to secure your Instagram photos. This one of the thing which helps you in keeping the monotonous throughout every social media platform you use for your marketing. This allows you to keep your content and postings similar, so you don’t need to create separate content or separate posting for each platform. I use this applet to keep my client’s Facebook and Twitter profile picture synced to showcase the brand. 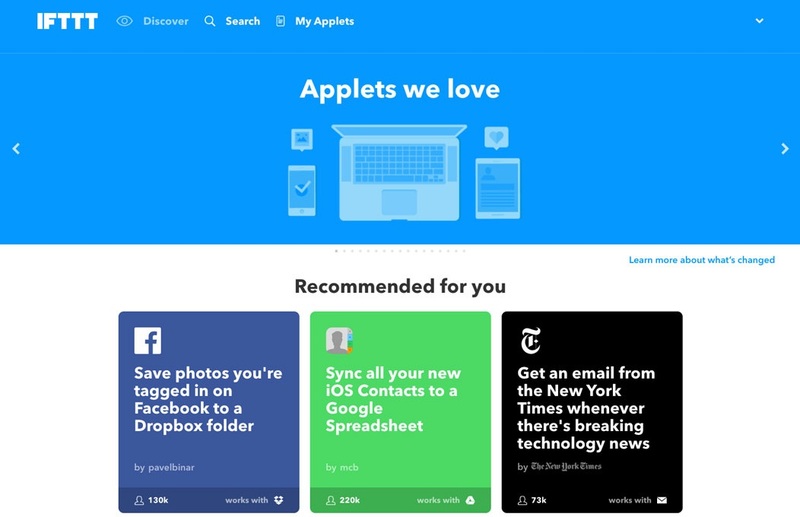 All these applets are for improving the productivity of smart social media marketers. However, the real social media marketing revolves around the creativity of the marketer. The above applets and many other like that are only here to speed up the process and help the digital marketer to manage multiple accounts simultaneously. Since his Master in Marketing from the Stanford University, Arabella has been involved with many companies for their marketing purposes. Not only this, but he also possesses excellent writing skills and also provides Custom Dissertation Writing Services UK to the students in need.